With Major League Baseball's celebration of Jackie Robinson's debut earlier this month, a lesser known version of that historical day has been illuminated by the voice of Ed Stevens. Who is Stevens, and why should you care about his story? He is the man who faced the following question for the past 60 years, "How did you let a black man take your job?" 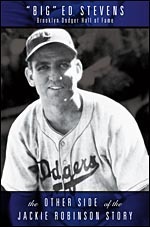 Stevens was the starting first baseman for the Brooklyn Dodgers during the 1946 season, placing second on the team in home runs. He rightfully bested a handful of Dodger hopefuls during their 1947 spring training to earn the starting nod at first base. Stevens was ready to go on Opening Day, until a last minute decision by Branch Rickey to insert Jackie Robinson befuddled the upstart from Galveston, Texas. "The Other Side of the Jackie Robinson Story," details the never before told story of the man who was displaced by Robinson. Stevens is one of the last living Dodgers who was there for Robinson's debut, and gives an excellent behind the scenes look from the perspective of a talented ballplayer who was pushed aside by the Brooklyn Dodger organization so that Robinson could take the field. Bitter Stevens is not; he shows no ill will or animosity towards Robinson. "The Other Side," presents the unheard emotions of a man who returned home to the heavily segregated South to face the snickers and sneers of people who could not understand how a white man "let" a "ni--er" take his job.